The origins of Tie-dye T-shirts are believed to have begun in Nigeria where women would tie cotton fabrics into knots and then dip them into dyes. When they untied the knots, they were presented with vivid, colorful cloth patterns. In Japanese society, Tie-Dying was also practiced as kimonos were colored by using thread to restrict areas of cloth much as the Nigerian knots did. The concept behind both methods was to restrict the flows of a dye from reaching certain areas of cloths and this was achieve through the use of knots, thread, rocks, sticks and rubber bands. The parts that the dye is able to reach will be altered but the restricted part will stay untouched providing a pleasant contract of colors, generally situated right next to each other. 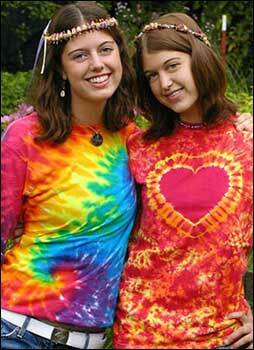 The popularity of Tie-dye T-shirts took off in the late 1960s during the hippie/peace movement. With the advent of the “psychadelic” generation, free spirited music and uninhibited free love movement, the tie-dye t-shirts proved a stark contrast to the button down, starch collared appearance of parent and authorities. As music stars from Jimi Hendrix to Janis Joplin sported them, the shirts seemed to serve as a symbol for the generation and for the change in times. As the Age of Aquarius faded into the era of Disco, tie-dyed shirts faded from the spotlight. However, as the Grateful Dead grew their fan base during the 1980s and 1990s, the shirts returned to popularity, not only among their concert goers, but among the free spirited youth of the day.